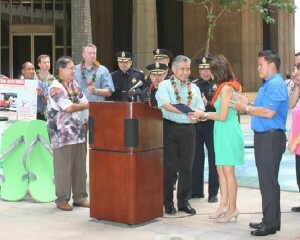 HONOLULU – Governor David Y. Ige and the Hawaii Department of Transportation (HDOT) kicked off the state’s 6th annual Pedestrian Safety Month today with a proclamation signing at the State Capitol. Hawaii is the only state in the nation with a statewide pedestrian safety month. The objective of the campaign is to create heightened awareness of pedestrian safety with the ultimate goal of saving lives and making Hawaii a safer place to walk. Walk Wise Hawaii partnered with Kamaaina Kids, an after-school program serving over 9,000 children statewide, and McDonald’s Restaurants of Hawaii in an educational campaign to teach Hawaii’s keiki and kupuna good pedestrian habits. 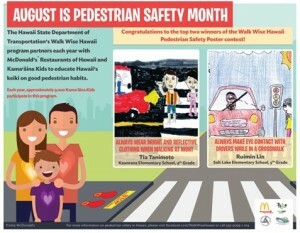 “Walk Wise Hawaii coordinated a statewide poster contest and asked keiki to design a pedestrian safety poster that depicted one of two important pedestrian habits: (1) to always make eye contact with drivers when in a crosswalk and (2) to always wear bright and reflective clothing when walking at night,” Fuchigami said. The Governor recognized the top two finalists from over 4,500 entries at today’s news conference. The winners were Tia Tanimoto, a fourth grader from Kaumana Elementary School in Hilo for her poster depicting a boy and girl wearing bright and reflective clothing while in a crosswalk and Ruimin Lin, a fifth grader from Salt Lake Elementary School for her poster depicting a girl prior to entering a crosswalk making eye contact with a driver. The winning posters will be printed on McDonald’s Restaurant of Hawaii tray liners at 75 locations throughout the state during the month of August. It is expected that over half a million McDonald’s of Hawaii customers will be exposed to this messaging. DOT’s Walk Wise Hawaii program is teaming up with public partners such as the City & County of Honolulu’s Department of Transportation Services and all four county police departments. 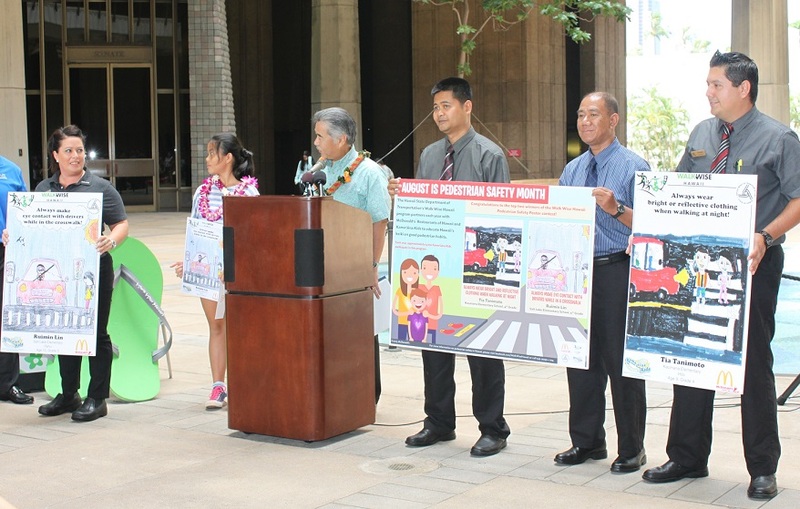 Private partners such as AAA-Hawaii, DTIRC Insurance, Farmers Insurance Hawaii, Geico Insurance, Girl Scouts of Hawaii, Kamaaina Kids, McDonald’s Restaurants of Hawaii and Moms In Hawaii are also joining the efforts to educate pedestrians. Pedestrian-related community events and campaigns will be taking place throughout the month to encourage safe pedestrian behaviors and raise driver awareness of pedestrians. 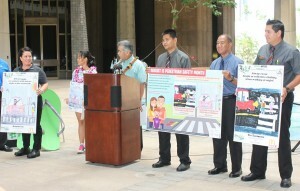 For more information on Walk Wise Hawaii and a list of specific Pedestrian Safety Month events, please call 587-2160 or visit www.facebook.com/pages/Walk-Wise-Hawaii. Walk Wise Hawaii is a public education program focusing on pedestrian safety and driver awareness and is sponsored by the Hawaii State Department of Transportation through its “Safe Communities” program with funding from the National Highway Traffic Safety Administration (NHTSA). Walk Wise Hawaii has employed extensive outreach methods including partnerships with public and private entities. Over the past five years research shows that pedestrian crashes are the 7th leading cause of fatal unintentional injuries in Hawaii.